Coincidental similarities between the surnames of Sarah Palin and Jeremy Lin aside, the two unique underdogs share more in common than the ability to sell boatloads of merch. Just as Palin was beloved as a symbolic thumb in the eye of media “elites” and coastal liberals with fancy educations and quinoa fetishes, Lin, too, embodies everyman egalitarianism. A beauty queen who attended community college in Idaho can become the leader of the free world. The unheralded 12th man on the bench can be an NBA All-Star. If given the fair shot, gosh darn it, anyone can do anything. 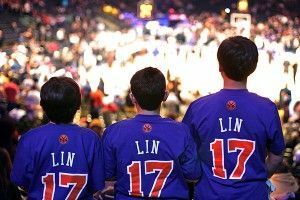 During the Knicks’ seven-game winning streak in early February, Lin’s string of dynamic performances reinforced the ever-popular narrative that so-called experts are, in truth, idiots. All those scouts and coaches who undervalued him were pea-brained, clipboard-carrying poindexters too enamored by the vertical leaps of products from Big East jock factories to recognize his ability. You can’t measure heart on your stopwatch, nerd! But after a bit of scrutiny, it was revealed that Palin was a bumbling megalomaniac better suited for field-dressing moose than being in line for the most powerful office on the planet. There’s no evidence that Lin is anything but a humble, hardworking young man who hopes only to make the Knicks a competent basketball team. Still, while Palin and Lin gave struggling organizations bursts of success and inspired oxygen-sucking media firestorms, both were ultimately unequipped for the crown of savior that was prematurely placed upon them. In Sunday’s game against the Celtics, Lin went 6-for-16 with six turnovers as Boston beat New York 115-111. During a five-minute stretch of the second quarter, he threw two baseball passes out of bounds, was called for a charge, and lost his feet on a fast break (the Knicks got the ball on that one). In overtime, he took six shots and made one of them. Meanwhile, Rajon Rondo, his counterpart on the Celtics, victimized the Knicks with a cartoonish stat line of 18 points, 17 rebounds, and 20 assists. Lin’s plus/minus was -9 for the game; Baron Davis’s, his backup, was +10. While his ballyhooed Harvard degree would seem to indicate a meticulous and studied approach to the game, Lin courts chaos. He can spin out of control, leaping into the air without an apparent escape plan or flopping across the hardwood like a hooked salmon. Even his successful plays — like the five crucial points late in regulation against Boston — often cap off sloppy sequences. For someone who values analytics over anecdotal observation, this creates a logical conundrum. Lin had incredible performances against contenders such as Los Angeles and Dallas. The Knicks have triumphed in the majority of their games since he entered the starting lineup. And stat wizard John Hollinger has compared Lin’s early returns to numbers put up by Isaiah Thomas and Kevin Johnson. That said, it’s hard to shake some of the visuals we’ve seen lately. Against the Heat, Mario Chalmers’s incessant badgering was so effective that Lin seemed hesitant to even bounce the basketball. When Miami disrupted the Knicks’ vaunted pick-and-roll with double-teams, Lin would pick up his dribble 25 feet from the basket and pivot in panic toward his own backcourt. This isn’t something an NBA viewer is accustomed to witnessing. Starting PGs almost never get ripped while simply bringing the ball upcourt, and, en route to eight turnovers and 1-of-11 shooting, Lin was robbed in such a manner twice. While Lin played marvelously in recent games against Cleveland and Atlanta, he’s now being forced to jump-stop four feet from the basket, pump fake, and shoot fadeaways. He’s demonstrated a knack for squirting such shots through the hoop, but they’re not pretty or easy. Over the last week or so, Lin has been tormented by other opposing point guards. Kyrie Irving dropped 22 points and seven assists. Jeff Teague had 18 points. Deron Williams scored 38. Rondo went bonkers. Not all of this abuse has been directed against Lin — in a number of games, he’s been taken off the other team’s point guard out of necessity. While it could be argued that Lin’s elevated profile has made him a target, a lot of these guys are just better than he is. Due to his mortal athleticism, cerebral reputation, and role as the ringleader for coach Mike D’Antoni’s circus, Lin has consistently drawn comparisons to Steve Nash. But even in Nash’s early stages of development — those first four pupae seasons, when there was little indication that a radioactive beetle bite would morph him into a two-time MVP — he was miserly with the basketball. After he earned substantial playing time, Nash never averaged fewer than 2.5 assists for each time he coughed up the rock. As his career progressed, it leveled off at about 3-to-1. Lin’s assist-to-turnover ratio is currently 1.67. By this metric, he’s similar to Russell Westbrook, Monta Ellis, and Tyreke Evans, three guys who share a reputation for reckless profligacy with snaggle-toothed Ozarks lottery winners. Per 36 minutes, Lin shoots almost 16 times, also roughly the same as those three players have averaged for their careers. There’s little doubt that Lin has the vision and unselfishness to become a crafty orchestrator of the offense, but it might not be who he naturally is. Enough. Slagging off Lin is no fun. His rise has been a wonderful spectacle that redeemed an otherwise noxious start to the Knicks’ season. Lin is a valuable piece to have on the roster and probably the team’s best current option at point guard. In D’Antoni’s system, he’ll have every opportunity to rack up assists, knock down open jumpers, and develop the necessary judiciousness to keep contributing at a high level. But Linsanity as a phenomenon worthy of elaborate signage and tired punnery needs to die a quick death. Like most guys in the NBA, he’s neither a star nor a fraud — just a player who can do useful things in the right situation. Mostly, Knicks fans should be more concerned about Amar’eCan’tJumpAnymore Fever.